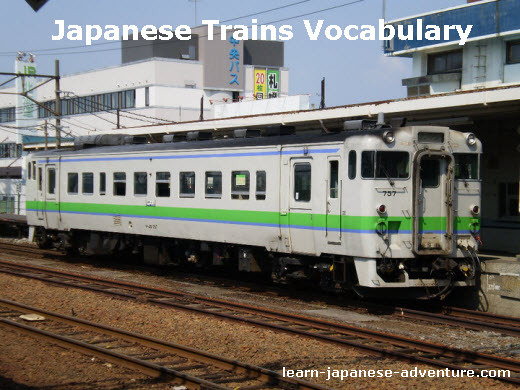 This section covers the words and vocabulary used to describe Japanese trains and stations. Japan has her own train system which is quite different from the systems in other countries. If you are first time traveling to Japan, you'll probably feel lost in the complicated train network. Don't worry. If you stay there for a while, take some time to study the system and I am sure you will get used to it. Besides, people there are generally quite helpful. But you need to speak some basic Japanese in order to communicate with them. The following vocabulary list on Japanese trains and stations may give you some clues on the terms used. Take some time to absorb them. Come back here again to refresh your memory whenever you need to do so. Let's see what we have in the Japanese trains word list. The above is the vocabulary list on Japanese trains and stations which I hope can help you familiarize with the terms used there. I will continue to look out for additional words related to Japanese trains and stations and add them to the list.